I wrote recently that the UK had the second-lowest forest cover of any country in Europe (see post). More specifically with 12% forest cover the UK has the same forest cover as the Republic of Moldova. 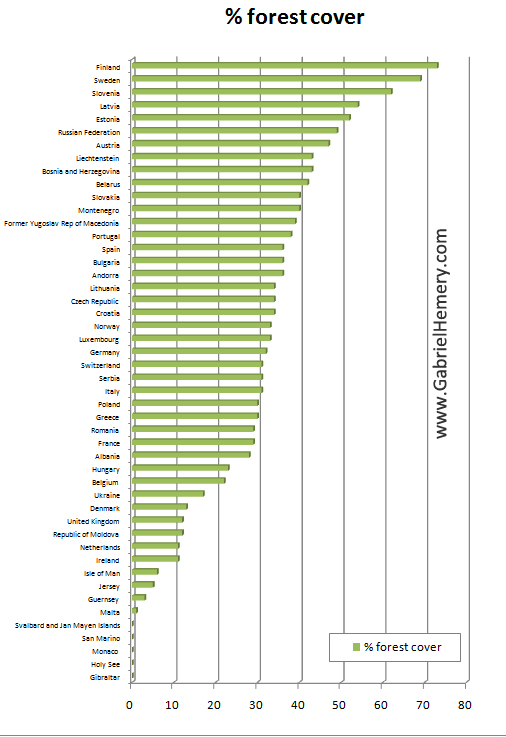 Ireland and the Netherlands are equally the least-wooded countries in Europe, each with 11% forest cover. There are four territories with less cover: Isle of Man (6%), Jersey (5%), Guernsey (3%) and Malta (1%). Gibraltar, Holy See, Monaco, San Marino and Svalbard & Jan Mayen Islands all have 0% forest cover. For updated stats (2015) please click here. At the other end of the scale, Finland tops the league of forest-clad countries with an amazing 73% forest cover. Sweden, Slovenia, Latvia and Estonia all exceed 50% forest cover. The UK’s other nearest neighbours have close to three times its forest cover: France (29%) and Germany (32%). These statistics come from the Global Forest Resources Assessment 2010 of the Food & Agriculture Organization of the United Nations (FAO). Based of these data I created this bar graph to illustrate the percentage forest cover of all European countries, ranked by cover. For updated stats please click here. Gabriel – I expect you know a fair bit about how other European countries organise their forestry and in the fallout from the Government sell off it would be particularly interesting to pick out salient features. In particular, I’ve always seen Scotland aligned in geography & demography to Scandinavia – so it may be fair to draw comparisons with Sweden, for example. England, however, is quite different – 2nd only in population to Holland, where Staatsbosbeheer,originally the Dutch FC, is now a combined Forest & Wildlife service managin both National forests and nature reserves primarily for public benefit. Thanks Rod – an interesting view which as you say would be good to follow up. I will post something on this soon. Thanks for your question. Based on the the same published stats that I cite (2010), I calculate that Iceland has a forest cover of less than 1% (0.29% precisely). I hope this helps. I’d be interested in why you ask. No one ever mentions Iceland, and yet the Southern section of the island was covered with scraggy birch forests when the Norse arrived. The Icelanders may be environmental saints today, but their ancestors sure weren’t. The lack of trees and hedges (something we do have in abundance in the British Isles) has led to massive erosion and soil degradation. The problem is that the trees can’t grow back because of all the sheep, they only return when planted and fenced in or when growing out of the way of grazing sheep. Personally I think a few areas of forest should be replanted there. 10% forest cover would hardly be hard for a nation which is almost empty. Birches, willows and perhaps some introduced sycamore perhaps. well then say me where is europe or what is europe. a continent or a peninsula of asia. puah stupid you. Do you prove to me that europe is a continent? china and germany are in the same continent. stop it. Would definitely like to see more forest cover in Ireland,.. in particular oak and other deciduous trees,.. not the current coniferous wastelands. What forests should be encouraged in Ireland? Mixed deciduous and conifer using uneven-aged systems, such as continuous cover, so that they look beautiful, are productive yet able to be managed flexibly to meet changing needs of society? What is the appetite for planting non-native species in Ireland? Given that there are so few native species anyway, it seems to me that with some imagination, Irish forests can be diversified effectively. Completely agree with you. These Sitka Spruce plantations leave the soil extremely acidic when they are cut down, nothing else can ever be grown there again! (only with very extensive soil rotation). I can perhaps understand them being planted on the sides of mountains where the soil is very poor and it is difficult for anything else to grow. However, they are being planted in flat cut away bog lands (which could be ploughed,reclaimed,and planted with native deciduous trees!!). I see them all over the country, even very near my house. They seem so lifeless, I never hear any birds chirping near them. Those forests just seem dead. Of the 10% forest cover Ireland does have – only 1% are native woodlands, whereas the rest are conifer plantations from the 20th century! So many jobs could be created by the government if they hired people to prep the land for deciduous tree planting! Hi there. I really think you need to review your figures about the Iberian Peninsula. Thanks for the work and regards! Total area of forests and forest land in Croatia amounts to 2, 688. 687 ha which is 47% of its total land area. Not 33% as you shown. Where are Azerbaijan and Georgia? Those countries are transcontinental countries, so also part of Europe like Iceland and Russian Federation. Also Azerbaijan and Georgia are classified as European countries in World Map and are members of the Council of Europe and European Nations. European Union started the program of integration of Moldova, Ukraine, Azerbaijan and Georgia to European Union. Too many people in many European countries, more fields etc. No forest = no wildlife.